Agreed. Being unsure is no more the same as not believing in God as it is in believing in God. 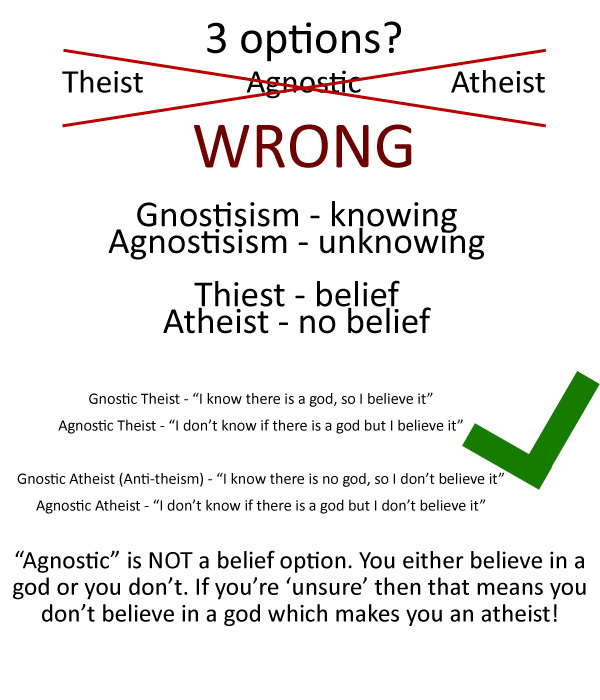 The poster says that, “‘Agnostic’ is not a belief option,” but doesn’t explain why. I think the idea is an Agnostic Theist is someone that *chooses* to believe in god, but doesn’t claim to be able to prove god exists. They’re willing to accept that their chosen deity or deities may not exist, but even with this knowledge (or lack thereof) they choose to continue their faith as they see value in it. This actually covers a large portion of the general population. Well then, by artificially constraining the discussion, the original argument is creating a false dichotomy and excluding real reasonable positions. Namely, those that don’t *choose* to believe anything, but simply acknowledge that they do not know, and don’t feel compelled to take a stand one way or the other without additional evidence. Therefore I think that the true scotsman fallacy is apt, and am confused as to why it got so much hate. Oh that would be the Stone/Fink/AlecDalek Karma Konsortium, hellbent on prolonging his War on Reason by embracing the same childish rating antics he claims to be a victim of. That’s not true at all. If you’re unsure as to whether a deity exists, you do not hold a positive belief that a deity exists… and that’s the entire definition of being an atheist. Displaying definitions of terms is not a no true scotsman fallacy because there’s no inherent shifting of goalposts. The problem with the OP’s comparison is assuming “belief” and “knowing” are mutually exclusive. Ask yourself: can you know without believing? Can you believe without knowing? The picture doesn’t assume belief and knowledge to be mutually exclusive, as is obvious in the description of “agnostic atheist” (etc) where it puts the two together. You can’t know without believing, but you can believe without knowing (religion). This is because knowledge is a subset of belief. And yet, “I don’t know if there is a god but I believe it” makes sense, but “I don’t know if there is a god but I don’t believe it” makes NO sense. You don’t know for a fact that unicorns don’t exist in the universe, but you can still disbelieve in them. I don’t see the problem with this, perhaps you could elaborate further on your examples. UID’s over 4 digits are all plebs.